Walmart is asking suppliers to lower prices after years of pressure to increase the minimums wage for employees. Wal-Mart (NYSE:WMT), the world’s biggest retailer, is focusing on expanding its grocery business and improving the experience of its workers’, among other long-term plans, company officials said Wednesday. 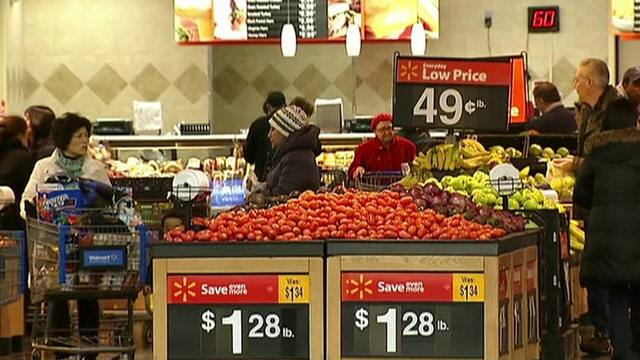 Wal-Mart U.S. President and CEO Greg Foran outlined the company’s strategic plans during a meeting with analysts. Foran was promoted to head up U.S. operations last summer. Feedback from customers in Phoenix and Huntsville, Ala., where the retailing giant recently expanded its grocery operations, has been “very, very positive,” Foran said. Meanwhile, the company plans to work with its employees on improving scheduling and benefits programs, in addition to raising wages for entry-level employees, a move announced earlier this year. Wal-Mart announced in February that it would raise all staff wages to $9 per hour by April of this year and to $10 per hour by next February. The move came after years of criticism that Wal-Mart didn’t pay entry-level employees a livable wage. “We’re investing more in our associates through better pay and improved career paths,” Foran said Wednesday. Foran, responding to a question from an analyst, said he wouldn’t discount initiating a loyalty program at Wa-Mart, something the company hasn’t done, but that the best way to retain customers is to offer the “right price” in the first place. “But I never discount anything,” he said. Wal-Mart’s shares were down $1.29, or 1.57%, at $80.96 in midday trading, not notably impacted by the company’s strategic update.